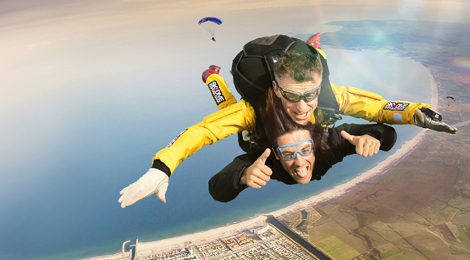 On your first parachute jump, you will be accompanied by a professional instructor who has jumped thousands of times. After a short briefing about what a tandem jump involves and some simple instructions, you will ascend to an altitude of 4,000 metres in a light aircraft and then, together, you jump. You will experience one minute of freefall until you reach an altitude of 1,500 metres, at which point your instructor will open the parachute. You will then experience a 5-minute flight with your tandem parachute over the wonderful landscape of Empuriabrava until you land gently at the point where your family and friends are waiting for you. Flights take off from the Empuriabrava Aerodrome, fly over the Empordà region and offer breathtaking views. The aircraft navigates over the beautiful mountainous north of Catalonia: Roses, Cadaqués, Cap de Creus, the ruins of Empúries, L'Escala, the Medes Islands and Cap de Begur. Freefall simulator for beginners and experts. Multi-adventure zone at Empuriabrava, just 150 km from Barcelona. Zone with a range of available adventure sports that include skydiving, light aircraft flight, a pilot’s school, tennis, paddle tennis and a wind tunnel.